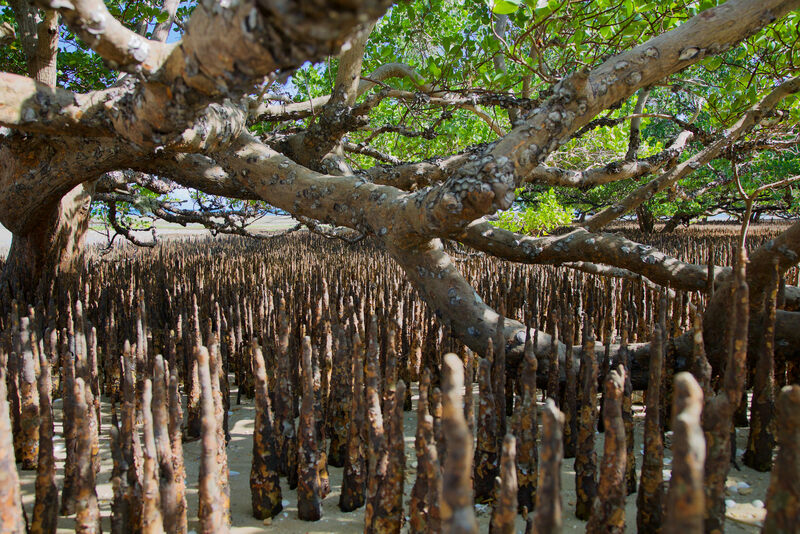 East African mangrove restoration includes a planting project in Kenya’s Vanga Bay in Gazi. Photo by Rob Barnes, courtesy of GRID-Arendal. 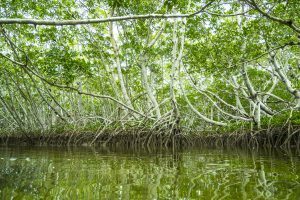 In spite of all the valuable services that mangrove forests provide us, scientists know surprisingly little about this ecosystem, especially in East Africa. This lack of data is a big challenge for policymakers trying to develop mangrove management plans. “If you don’t know where the forest is, it becomes very difficult to manage,” explains Juliann Aukema, global climate change specialist at the USAID Office of Global Climate Change. Two USAID-funded programs are trying to address this, both globally and regionally. The goal of the Sustainable Wetland Adaptation and Mitigation Program (SWAMP) is to provide policymakers around the world with credible scientific information to make sound decisions relating to the role of tropical wetlands in climate change adaptation and mitigation strategies. 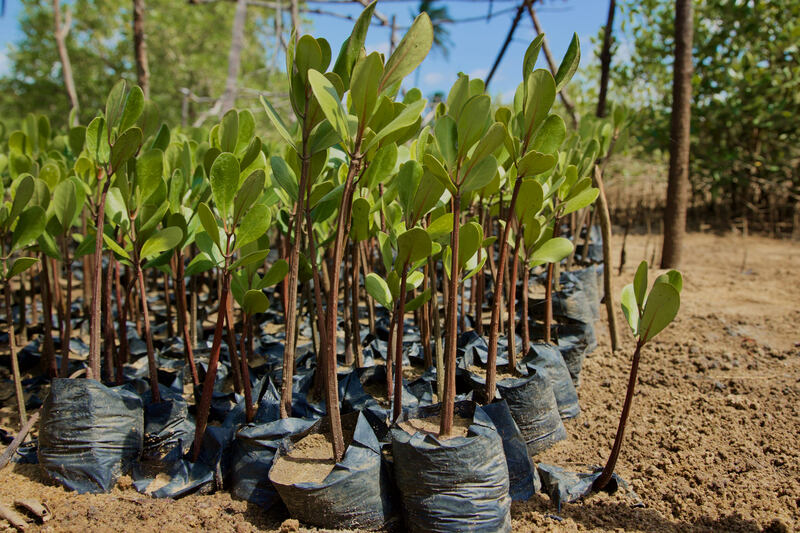 The East Africa Mangrove Carbon Project (EAMCP) was initiated in 2013 to build regional capacity to improve the sustainability of mangrove ecosystems, including improving local institutional capacity to generate and use scientific information to manage, conserve, and develop policies for mangroves in a changing climate. Both programs emphasize building local capacity for scientific research, both in terms of equipment and human skills. “Building local capacity at the institution level, particularly with the universities, has been really, really important,” says Trettin. He explains that before the programs started, for example, only mining companies could afford to measure carbon samples on the continent. Affordable services just weren’t available. Faculty at Mozambique’s Eduardo Mondlane University have since received a USAID grant to purchase a carbon analyzer, and, with the support of USAID Mozambique’s Coastal City Adaptation Project (CCAP), the university has become a regional hub for processing samples and associated mangrove research. Perhaps more important than equipment is developing technical expertise. “The development of young professionals – I think that’s immensely important in terms of building capacity locally that’s going to stay there,” says Trettin. Mangroves are resilient to coastal storms and flooding but vulnerable to aquaculture and coastal development. Photo by Aaron Hawkins, via Flickr. 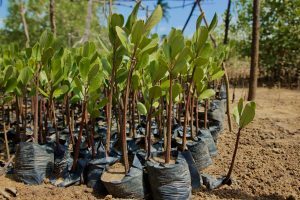 In a 10,000-hectare section of mangrove forest in the Rufiji Delta, the EAMCP, together with the Tanzania Forest Service and the Institute of Marine Sciences at the University of Dar es Salaam, is focused on developing sustainable forestry management techniques. “This is a research and training forest where we can practice and do some long-term studies across the disciplines,” explains Mwita Mangora, deputy director of the Institute of Marine Sciences. Over the course of the first several years of the programs, researchers have amassed a good baseline for the state of mangrove forests in East Africa. The emphasis now is on using those data to develop sound policy and management, particularly with regard to community use of the forests. “How can we inform this policy direction and the legal requirements to benefit the two actors—the communities and the state—so we remove the long-based frictions between them?,” says Mangora. 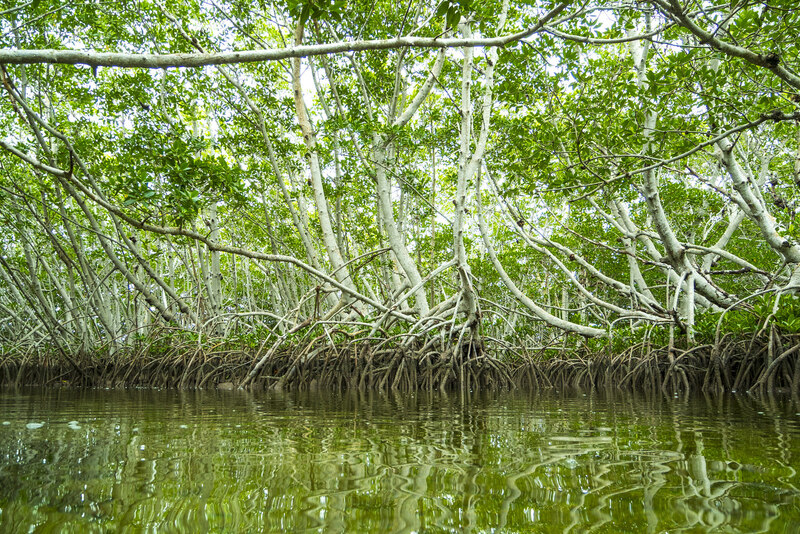 Mangrove ecosystems sequester carbon below-ground in root biomass and organic peat soils. Photo by Rob Barnes, courtesy of GRID-Arendal. In Rufiji, there are plans to test the effectiveness of different management scenarios. Are various agroforestry practices viable? Is a strict conservation approach practical? Should certain areas be given over to unrestricted human use? This article was originally posted on USAID’s climatelinks blog and is re-posted with permission. Read about current SRS research on mangroves. For more information, email Carl Trettin at ctrettin@fs.fed.us.